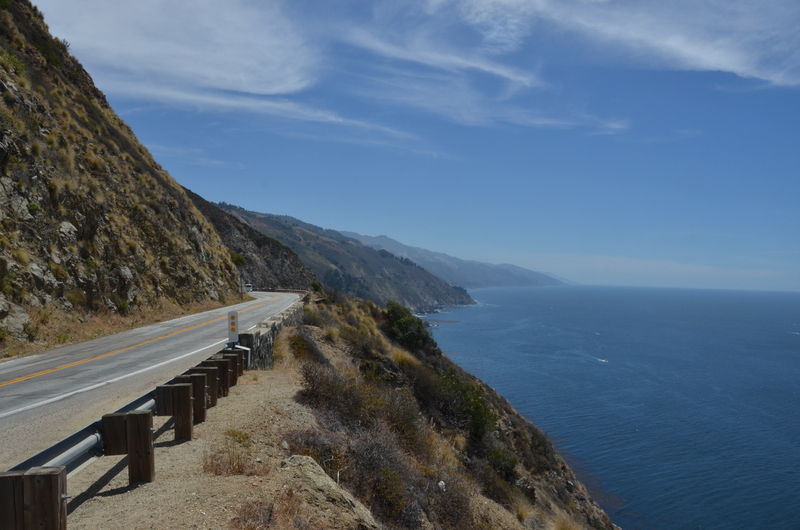 Vulture survey route along the California coast. I have dreamed about surveying turkey vultures in California for a long, long time. The opportunity finally arrived this July when spring 2015 Hawk Mountain trainee Katie Harrington returned to her home base in San Francisco late last month. Katie and her fiancée James Fahlbusch volunteered to help and the three of us mapped out seven, day-long road surveys that would follow the coast north and south of San Francisco as well as inland from just north of Redding to south of Bakersfield. The plan was to travel the roads at 35 mph and record all of the turkey vultures we saw. Then, repeat the same route in mid-winter 2015-2016 to investigate seasonal changes in vulture distribution and abundance. We also planned to record the flight heights and group sizes of all of the birds we saw, as well as to look for and record the locations of California condors along the way. Having conducted road surveys in 22 other regions stretching from Canada at the species’ northern limits to Tierra del Fuego, at its southern limits, I was excited to say the least. The fact that California was exceptionally hot and tinder-box dry this summer only added to my excitement. A California condor with wingtag soars overhead. Our surveys, which covered 1,280 miles, produced 1,306 sightings of turkey vultures, or more than one vulture per mile, a relatively surprising find given that several of the routes passed through “agro-industrial” and suburban areas. 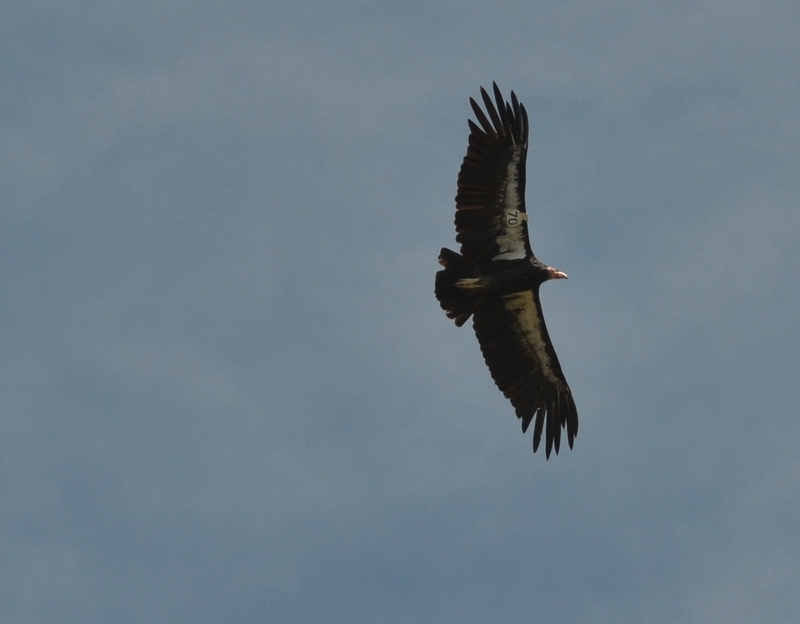 We also saw seven California condors, most of which flew close enough for us to read their wingtags. 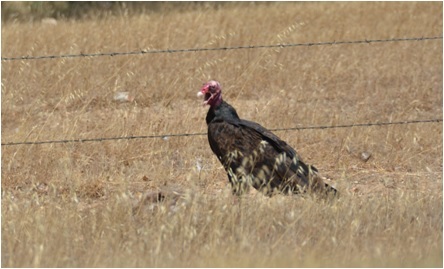 Intriguingly, all but one of the condors sighted were flying in close proximity to turkey vultures. Remarkably enough, the ecological relationship between these two species has been little studied. Except for the not-surprising fact that turkey vultures are known to be behaviorally subordinate at carcasses to the more massive condors we know little of the ecological relationships between these two avian scavengers. What we do know is that while larger and more-agile avian scavengers typically dominate smaller and less-agile ones at food sources, numerical abundance at a carcass sometimes allows smaller scavengers to dominate larger scavengers. And this is exactly what happens when large gangs of black vultures overwhelm and dominate far larger, but less numerous, Andean condors at carcasses in South America. A turkey vulture feeding on a raccoon. Although turkey vultures are far less social than black vultures and rarely group in large numbers at carcasses, they may out-compete the large California condor in other ways. First, their keen sense of olfaction should allow them to locate rotting carcasses faster than condors, and thereafter consume at least smaller ones before the condors find them. Second, their larger numbers might allow them to finish off larger carcasses partially fed upon by condors–and then left for later–more rapidly, thereby reducing the amount of food available to the larger birds. Intriguingly, our miniscule one-week field effort suggests that the two species sometimes share the same airspace and, presumably, the same carcasses. Given the current status of condors as a globally-endangered species and the amount of field work and funding now focused on speeding their recovery, careful studies of interactions–both behavioral and ecological–between condors and turkey vultures would seem to be in order. Keith and Katie examine the raccoon. Our next road surveys in California are scheduled for winter 2015-2016. Katie, James, and I look forward to exploring the distribution and abundance of vultures then, as well as to observing the behavior of vultures and condors as they search for food across the California landscape.